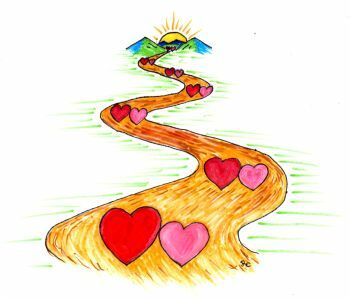 Synopsis: Decision to make a love improvement, The usual human pattern, 7 ways to enhance getting your love improvement to be permanent, A ‘Love Success Question’ to play with. Suppose you decide to make an improvement in the way you show your love. Or maybe you make a decision to respond to a loved one in a more loving way. Possibly you vow to yourself that you’re going to respond better to your loved ones in situations that are difficult. Then you forget, and don’t do what you decided you were going to do to make your love relationship improve. That’s human! Old habit patterns tend to overwhelm new decisions unless you add some other things to your decisions. Don’t be discouraged. There are ways to make your decisions for love improvements into lasting reality. Let’s understand a few things about human improvement. For making an important behavioral change it usually takes from three to six months to make any new behavior permanent according to some of the psychologists who research this sort of thing. The usual pattern involves a decision to improve, some action to effect the improvement, forgetting to do that action, recommitment, forgetting again, recommitment again, getting it right some more, forgetting some more, then doing the improvement a lot more, forgetting less, then getting it right most of the time, then only rarely forgetting again and finally you’re doing the improvement automatically and consistently. Even so, once in a great while you might slip. That’s what’s involved in the way many humans go about making love relationship improvements. This may seem a bit arduous but the improvements and the joys these improvements bring, and the troubles they bypass, make it definitely worthwhile. Remember that in love, like so many other things, you’re either going up or you’re going down. The wisdom of the love sages of the world tells us there is no standing still without stagnation as a result. Stagnation leads to deterioration which leads to death. So, the hard love message seems to be we are either working to improve and grow our love relationships upward or we are drifting downward toward love relationship dysfunction and perhaps ruin. The good news is love improvements get great results and get to be a lot of fun. 1. When you fail to act in ‘the more loving way’ you had decided to act, don’t beat up on yourself or put yourself down. That just works to discourage, de-energize and defeat yourself. Instead just RECOMMIT. Remember the sport’s adages “You can’t win them all, or win them all all of the time” and “Never play strike one, I’m out, and the game is over”. Know that those who succeed are those who fail and don’t give up. The old Scout law teaches “…defeat does not down him (or her)” the true victor. 2. Don’t just try to ‘stop doing’ any negative, unloving, non-loving or anti-loving behavior. Stopping an action is a whole lot harder than REPLACING AN ACTION WITH A NEW BEHAVIOR. Old habits tend to prevail until you program in their replacement habit. “I’m going to stop yelling” does not work as well as “I’m going to talk softly”. 3. Make your new love improvements BEHAVIORALLY OBSERVABLE. It does not work very well to decide to ‘be more affectionate’ unless you add the observable behaviors of “I’m going to hug three times a day, cuddle at night and hold hands when we go to the movies”. These are observable, exact behaviors. While affection is a good concept it’s too broad and abstract by itself to help most people actually change. 4. Keep a DAILY CALENDAR record for at least a month, recording your efforts to improve. Every day you act to demonstrate your love as you have decided to do, draw a ♥ or make a on your calendar. Every day you don’t do what you could have done draw some other symbol. Keep working to get more hearts or :-)’s than marks indicating you ‘missed’. 5. TELL ONE OR MORE PEOPLE who care about you what you’re doing to make a love improvement. Ask them to ask you how you’re succeeding every so often. Also ask them to celebrate your victories, and say supportive things when you miss your goals. You, of course, can offer to do the same for them. 6. REWARD YOURSELF the first, third, fifth, seventh and 10th times you accomplish your chosen love improvement action. Then erratically keep rewarding yourself every so often. Rewards can be anything from self praise, to buying yourself a present, or giving yourself a special experience. Getting your loved ones to help you with rewards also is a good idea. Rewarded behavior continues and establishes new habits far faster than unrewarded actions. A rewarding approach often tends to be as much as seven times more effective than a punishment approach. 7. Every so often REMIND YOURSELF that by improving your love actions you are likely acting to improve the health, happiness and all over well-being of not only those you love but also yourself. Medical research has shown that giving love improves the biochemistry of the giver as well as the recipient in a surprising number of very important healthful ways. There are lots of other ways to work on making love improvements ‘lasting’ or ‘permanent’ but these seven, if you apply yourself, are likely to help quite a bit. ♥ Love Success Question What will be your effect on your loved ones and on yourself if you DON’T work to improve your ways of demonstrating your love and interacting with love?